NEW YORK (CNNMoney.com) -- Ford Motor Co. announced Wednesday it is killing off the slow-selling Mercury car brand after 71 years. The move had been widely expected as Ford has revealed few new products for the brand in recent years. Winding down Mercury will allow the automaker to focus more attention on its mainstream Ford brand and especially its luxury Lincoln brand, Ford executives said. "We decided we're going to focus our efforts and resources on continuing to grow the Ford brand and accelerate Lincoln," said Mark Fields, Ford's president of the Americas, in a press conference at Ford's Dearborn, Mich., headquarters. Ford will end production of Mercury products by the end of this year. Over the next several years, Lincoln will get seven all-new or drastically changed vehicles, Derrick Kuzak, Group Vice President, Product Development, said. No jobs will be lost at Ford (F, Fortune 500) because of the brand's closing, Fields said. He would not say how much the brand closure will cost, but that it will not change the carmaker's financial projections. Ford has said it expects to make a substantial profit this year. Henry Ford's son, Edsel, started the Mercury brand in 1939 when he was president of the company. 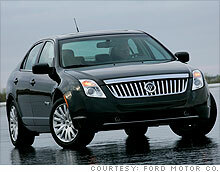 Mercury was seen as a way to fill the pricing gap between the inexpensive Ford brand and the luxury Lincoln brand. Unlike his father, Edsel believed in the importance of design in automobiles, and Mercury offered customers something a little more stylish than a Ford, often with a little more performance too. Sometimes Mercury sold truly distinct models that weren't otherwise available in U.S. showrooms, but in most cases, Mercury cars were slightly upgraded versions of Ford models with more fashion-oriented color and trim choices. While Ford brand market share grew 2.2 percentage points this year, Fields said, Mercury market share declined to just 0.8% of the overall market. "We've seen a migration of Mercury customers coming over to Ford," Fields said. Most Mercury sales are to fleet buyers and customers purchasing through employee, retiree and other company-related discount programs, Fields added. 1,712 dealers in the U.S. sell Mercury cars, but all of them also sell other Ford products. The loss of Mercury will pose no problem for dealers who also sell Ford brand cars, since the vehicles are very similar, said Bob Tasca, who chairs the Lincoln Mercury dealer council. It will be a problem for those who sell only Lincoln, as it will leave them without the smaller, less expensive vehicles Mercury offered, he said. Among the vehicles Lincoln will offer in the future will be a compact car, Kusak said. Ford will offer assistance to Lincoln-Mercury dealers in areas that won't support a luxury-only dealership, Fields said. Those dealers will be offered the opportunity to sell Fords, if that can be done, or their dealerships will be consolidated with an existing nearby Ford dealership and they will be financially compensated. "If we can get great products from Ford and we can get throughput, I don't care what they call the vehicles," said Tasca "A sale is a sale." Ford-Mercury dealers are excited about the change, Tasca said. "When you've got Fords and Mercurys on the same lot, and they look kind of the same, that doesn't really make a whole lot of sense," he said. At one point, Ford might have saved the Mercury brand and put it to good use, but making the brand meaningful was something the automaker should have started years, if not decades, ago, said Jeremy Anwyl, chief executive of the auto Web site Edmunds.com. "Through lack of attention the brand has lost relevance in the marketplace," he said, "and you can change that, but it's not cheap." A good, strong Mercury brand could have added sales and value, according to Anwyl, but it's too late now. Mercury might have had some meaning to customers long ago, agreed Jesse Toprak, an analyst with the auto Web site Truecar.com, but not anymore. "I don't think anyone under the age of 50 even understands what the heritage is," he said. Killing the brand now follows Ford chief executive Alan Mulally's strategy of focusing the company's resources on its core "Blue Oval" Ford brand. Ford has already sold off luxury car brands like Jaguar, Land Rover and Aston Martin. It is in the final stages of selling off Volvo. General Motors has had success by trimming what had been eight brands in the U.S. down to just four. GM sales were up 17% in May compared to last year, despite the contraction in brands. "We saw with GM what Ford can create by contracting to two core brands," said Toprak. Ford Motor reported a 23% rise in May sales at the three brands it retains. In contrast to Mercury, Lincoln will get more new products, some with engines and transmissions exclusive to the luxury brand. Ford also promised "fuel economy leadership" for each of the Lincoln products. With its new line-up, Lincoln will be squarely targeted at luxury competitors such as Lexus and Cadillac, Fields said.